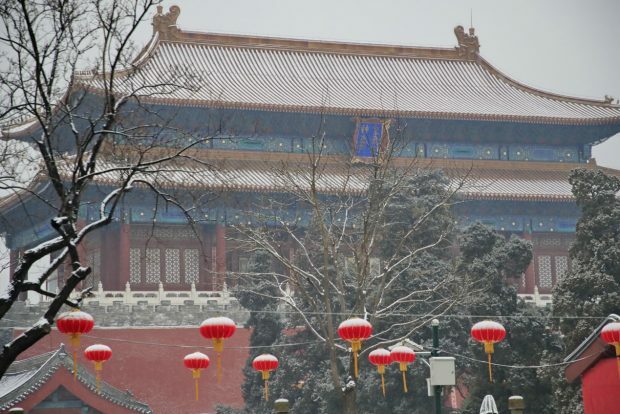 China’s Palace Museum, also known as the Forbidden City, will exhibit a series of famous cultural relics and fine collections, including one of the best-known ancient Chinese paintings, as it turns 600 years old next year, according to a two-year plan of the former imperial compound. To celebrate its 600th birthday, the museum, starting from the second half of this year, will stage dozens of exhibitions under the themes ranging from ancient flowers and plants to figure paintings of past dynasties and Longquan celadon crafts, Shan Jixiang, the museum’s curator, said on March 4. The exhibition themed “Longquan celadon and globalization” to be held this July will showcase celadon ware and replicas found in important trade hubs like China, Japan, the Republic of Korea, India, Iran, the UK, and the United Arab Emirates. These collections from the Palace Museum, British Museum, and other world-class museums will present visitors how prosperous the porcelain road on land and sea was in Song (960-1279) and Yuan (1279-1368) dynasties. Along the River during Qingming Festival, the famous painting by artist Zhang Zeduan from the Northern Song Dynasty (960-1127), will be displayed again in the exhibition on genre paintings of past dynasties to be held on Sept. 2020. The masterpiece, painted on a long scroll, depicts a panorama of flourishing urban life in 12th-century Bianliang, today’s Kaifeng in Henan province, which was the capital of the Northern Song Dynasty. When it was last displayed in 2015, visitors waited in long lines every day throughout the exhibition. The Hall of Mental Cultivation, the former residence of eight emperors of Qing Dynasty (1636 to 1912 A.D.) is estimated to be reopened to the public on Oct. 2020 after renovation and research work. Located at the west of the inner court in the Forbidden City, the hall had served as emperors’ residence and political power base since the reign of Yongzheng Emperor in 1723. The hall, covering an area of 5,000 square meters, measures over 63 meters in length, and nearly 80 meters in width. It also has a front yard, back yard, and rooms on the eastern and western sides. Starting from 2020, Yanxi Palace in the northeast of the Palace Museum, which used to serve as a residence for concubines, would be turned into a foreign cultural relics exhibition space. The Palace Museum has collected a rich variety of foreign cultural relics including celadon ware, enamel vessels, painting, sculptures, furniture, timekeepers, apparatus for scientific study from the UK, France, Germany, Switzerland, Russia, Italy, Austria, the US, Bulgaria, Japan, the Democratic People’s Republic of Korea, and other countries. These relics were made during the 16th to 20th century, most of which were manufactured in the 18th and 19th century. It also plans a series of exhibitions in other countries, including one displaying flourishing China in the 18th century in cooperation with Moscow Kremlin Museums in Russia, as well as another one exploring the role of empresses in the US. After the two scheduled to be held this March, it will hold an exhibition on clocks in the UK in March 2020. The museum will also bring 80 to 100 royal collections of the Ming Dynasty during the reign of Yongle Emperor and Wanli Emperor to the museum in Singapore for display in May 2020. It will also organize exhibitions to present its fruits in restoring cultural relics of dozens of categories, show how cultural relics are restored, and interact with visitors through displaying intangible cultural heritage.